The Embarcadero, San Francisco (Photo credit: Bob Collowan | CC BY-SA 4.0, Wikimedia). 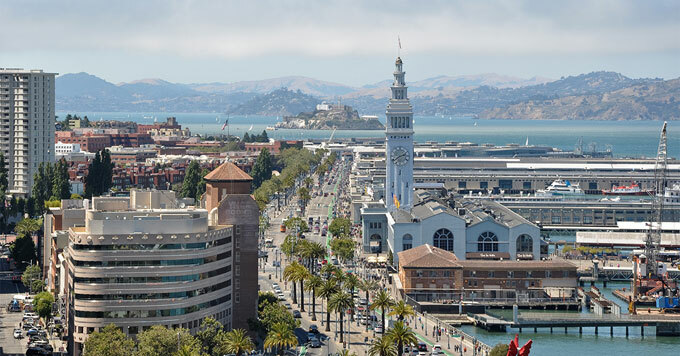 In San Francisco’s historic Embarcadero District, people ride bikes, eat at waterfront restaurants, and stroll on piers that jut into San Francisco Bay. But rising seas pose serious flooding threats to the Embarcadero. Already, during extra-high tides, water spills over a century-old sea wall onto sidewalks. And as sea levels rise, high tides and storm waves could threaten buildings, subway tunnels, and other infrastructure. To show how sea-level rise could affect the Embarcadero and two other San Francisco locations, a nonprofit called Climate Access created an app called “Look Ahead.” It allows users to explore a virtual reality simulation of the flooding that’s likely if carbon pollution continues unchecked. Director of innovation Lauren Graham says the app is not just about doom and gloom. It also shows a scenario where carbon pollution has been sharply reduced, and the city has made adaptations, such as raising and strengthening the Embarcadero seawall. … that shows how climate action can help protect the places we love.